After the new Carnival Magic sailed on its inaugural voyage out of Venice in 2010, Carnival Cruise Lines president and CEO Gerry Cahill outlined a host of innovations onboard the new ship, including RedFrog Pub, Cucina del Capitano, and SportSquare--as well as enhancements to sister ship Carnival Dream with innovative spaces like WaterWorks, The Lanai, and Ocean Plaza. Already-popular RedFrog Pub is inspired by the sights, sounds, and flavors of the Caribbean. Cucino del Capitano ("The Captain's Kitchen") features homemade pastas, risottos, and made-to-order Italian specialties each night for a nominal charge (a lunchtime pasta bar is complimentary). SportSquare has taken Carnival's bustling recreation areas to a new level, thanks to the industry's first ropes course where Carnival Magic passengers can traverse across nets suspended above deck 12. Along with all of the new offerings, several innovations were added to the general Carnival Dream concept. Introduced on the Carnival Dream, innovations to The Lanai and Ocean Plaza concepts include an on-deck barbecue, complimentary sushi, a patisserie serving specialty coffee drinks and sweets for a nominal charge, a separate bar, and a sandwich bar that provide an alternative to the Lido Marketplace and dining rooms. Also new on Carnival Magic is the Cherry on Top shopping option, which features candies, flowers, and more for all types of celebrations. Accommodations options onboard the 3,690-passenger ship include 54 suites and grand penthouse suites, 851 ocean view staterooms with balconies, 221 ocean view staterooms without balconies, and 719 interior staterooms. Included in the above options are 20 unique five-berth/two-bathroom cabins and many connecting staterooms targeted at families. There are 110 unique "cove" staterooms with balconies situated closer to the water line and 85 spa staterooms providing special Cloud 9 Spa access and benefits. Handicapped accessible suites in various categories number 35. Other various Carnival Dream favorites also onboard Carnival Magic include spacious facilities for children in three age groups, the casino, Cloud 9 Spa (including new Medi-Spa and Bliss treatment offerings), the adults-only Serenity retreat, Carnival's Seaside Theatre (the huge outdoor LED screen), and Carnival WaterWorks aqua park, with a twister water slide, funnel-style slide, and splash park. Carnival Magic debuted in Europe with a successful Mediterranean schedule and now operates year-round seven-day Caribbean cruises from Galveston, Texas. Two different week-long itineraries are offered: western Caribbean cruises to Montego Bay, Grand Cayman, and Cozumel and eastern Caribbean cruises to Nassau, Freeport, and Key West. The new Carnival Magic features many unique innovations. They include: Deck 5's RedFrog Pub is inspired by the sights, sounds, and flavors of the islands (a nod to Carnival Magic's Caribbean destinations). The 100-seat indoor/outdoor watering hole features a private label Thirsty Frog Red beer brewed especially for the ship's passengers. The pub's decor and vibe are decidedly tropical, as is a menu of pub snacks for a small charge, including Bahamian conch salad, grouper fingers, and firecracker Jamaican wings. Situated up on deck 11 above Lido Marketplace, Cucino del Capitano ("The Captain's Kitchen") is a new family-oriented offering that is a tribute to Carnival's long Italian lineage. Many of the line's captains and other senior staff are Italian and many Carnival ships--including Carnival Magic--were built in Italy at the Fincantieri shipyard. The restaurant features wood-beam ceilings and ornate ironwork reminiscent of an Italian home and kitchen, with archival photographs on the walls--including many from Carnival captain's personal collections. At dinner-time, for a nominal fee, Cucina del Capitano features homemade pastas, risottos, and made-to-order Italian specialties, along with Italian wines and beers. At lunch, a festive made-to-order pasta bar is complimentary. Atop the ship, SportSquare has taken Carnival's bustling recreation areas to a new level, thanks to the industry's first ropes course where passengers can traverse across nets suspended above deck 12. Guests can choose from a beginner and intermediate course traversing across rope bridges, swinging steps, and beams as they zig zag across elements named for notable bridges in Carnival homeports. There's also an industry-first outdoor fitness area, Carnival's first two-level miniature golf course, a Vita exercise course, a full-service bar, ping pong and foosball tables, and a lighted multi-purpose court for basketball, volleyball, and soccer. The top deck also includes an enhanced WaterWorks aqua park, including a "Twister" spiral water slide, a huge 300-gallon "dump bucket," the new Aqua Play splash park, and other wet and wild features. Along with their new ship, Carnival Magic, Carnival Cruise Lines recently unveiled "Fun Ship 2.0," a program that will dramatically transform its onboard guest experience. The multi-year effort will offer guests mouth-watering new dining choices, more exciting bars and lounges, and captivating entertainment options through innovative partnerships and new branded spaces. In the first phase alone, which extends through the end of 2015, Carnival will invest more than $500 million across its fleet. Carnival announced partnerships with: entertainer George Lopez, who will become Carnival's creative director for comedy and enhance its fleetwide comedy clubs; Food Network star Guy Fieri,who has developed a burger venue called Guy's Burger Joint; leading video game manufacturer EA SPORTS to create the first-ever EA SPORTS Bar at sea; and Hasbro for new larger-than-life game shows featuring iconic games and brands. The company also worked with leading production talent to create a high-energy musical showcase and announced that celebrity song master DJ IRIE was named Official DJ of Carnival Cruise Lines. Plus, Carnival announced more of its unique branded spaces with the RedFrog Rum Bar, BlueIguana Tequila Bar, and three other fun themed bars and lounges-- as well as a new complimentary BlueIguana Cantina casual dining option. The Carnival Liberty was the first ship to feature most of the new dining and bar venues. 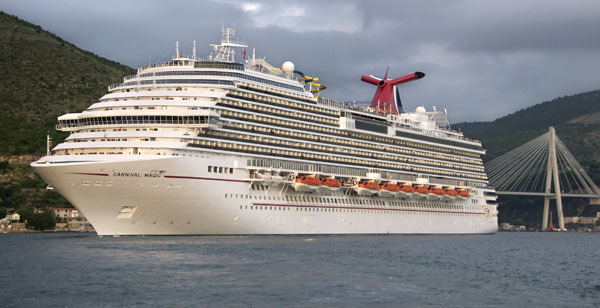 Fourteen ships are scheduled to receive many of the Fun Ship 2.0 enhancements through 2015, as well as new additions (like 2012's Carnival Breeze) to the Carnival fleet.